Review: Inter Arma, 'Paradise Gallows' The Richmond metal band's new album both expands and contracts the realms of extreme music; it's huge in scope and sound, with instrumental passages that take their time even as they destroy. Since the early 2000s, Orion Landau has been the in-house designer for Relapse Records, giving the metal label a distinct visual identity that spans album covers for the likes of High On Fire's Surrounded By Thieves, Rwake's Voices Of Omens, Jucifer's L'Autrichienne and practically every Obscura record. Paradise Gallows is now Landau's third cover for Inter Arma. He paints a collapsing ship on turbulent waves, just minutes from land, with a man hanging from its still-intact bow, but the sky burns warm colors as the sun sets and the night sky offers a cosmic embrace. The image fits the Richmond metal band, which is stately and bold in its heft, lyrically dark yet affirming in the long-term arc of existence. Those qualities have marked Inter Arma ever since its 2010 debut, as the band ingests all manner of metal to pull back on a heavy and psychedelic experience. After the dramatic twin-lead guitar heroics of the "Nomini" intro, "An Archer In The Emptiness" is Inter Arma in full-on death-doom mode, with riffs that summon frost giants from their slumber, cut across by T.J. Childers' shuffling blast beats, Mike Paparo's molten-lava growl and a closing guitar solo that recalls the echoing madness of Autopsy. But unlike his gore-obsessed peers, Paparo lyrically engages with death, solitude and the passing of time: "Oh, how I long / For a slumber so true / Beyond the ceaseless din / Of man's loathsome song." Throughout the album, Paparo recognizes the existential (and brutal) angst of 17th-century English-style poetry, though he filters it through the perspective of a dude in the South who sighs with an earth-shaking howl. In one of the band's first forays into "clean" (read: not screamed, growled or howled) vocals, the doomy and proggy title track looks back on the follies and failures of youth — "Time, have you forgotten my sullied name?" — with riffs that build melody in aching slow motion and a guitar solo that bends and squeals through a cathedral of organ swells. Inter Arma has often been compared to the graceful and boundary-free Neurosis, and not unfairly. But with Paradise Gallows, that similarity becomes more philosophical than aesthetic. In "The Summer Drones" — a lumbering piece of progressive sludge metal indebted to the Neurosis groove — we're lulled into a drawled Southern boogie. 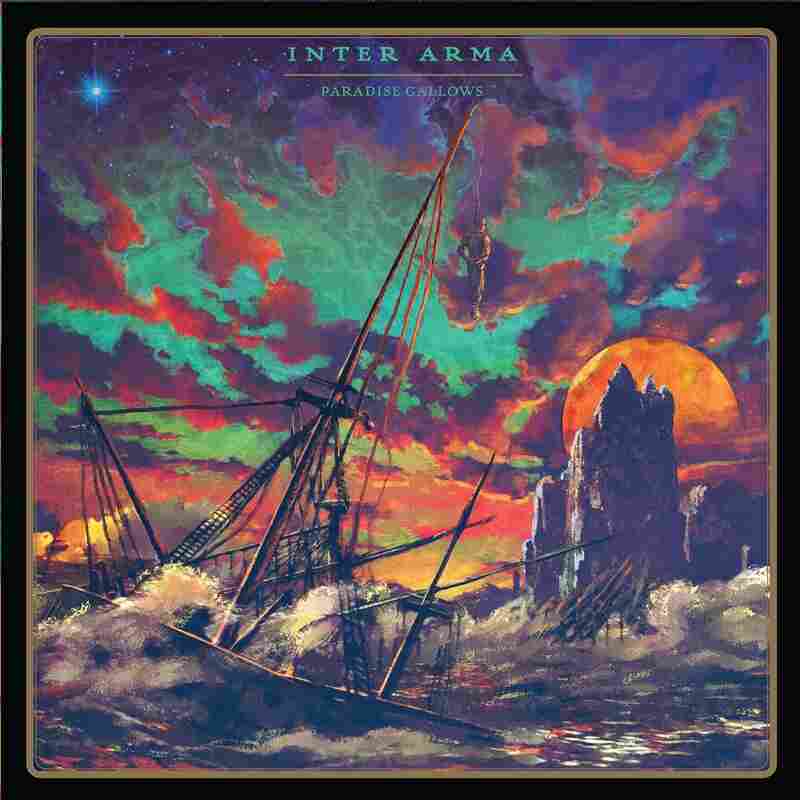 If anything, Inter Arma's embrace of blazing, clustered chords and rhythms (see: "An Archer In The Emptiness" and the scorching album highlight "Violent Constellations") speak more to the pulsing darkness of Tom G. Warrior (Celtic Frost, Triptykon) or the black-metal weirdness of Blut Aus Nord, but with avant-thrash flourishes that buzz and burn with frenetic energy. At 71 minutes, there's much to absorb here. This is, after all, a band that called 2014's The Cavern, a single 45-minute track, an EP. This is a huge record in scope and sound, with instrumental passages that take their time even as they destroy. With Paradise Gallows, Inter Arma both expands and contracts the realms of extremity.